This is my last week of storytime until the fall. I’ll be busy doing mostly school age programs during the summer, but will post about those as well. But I’ll see all the Flannel Fridayers in September!! This week for storytime my theme was bugs. 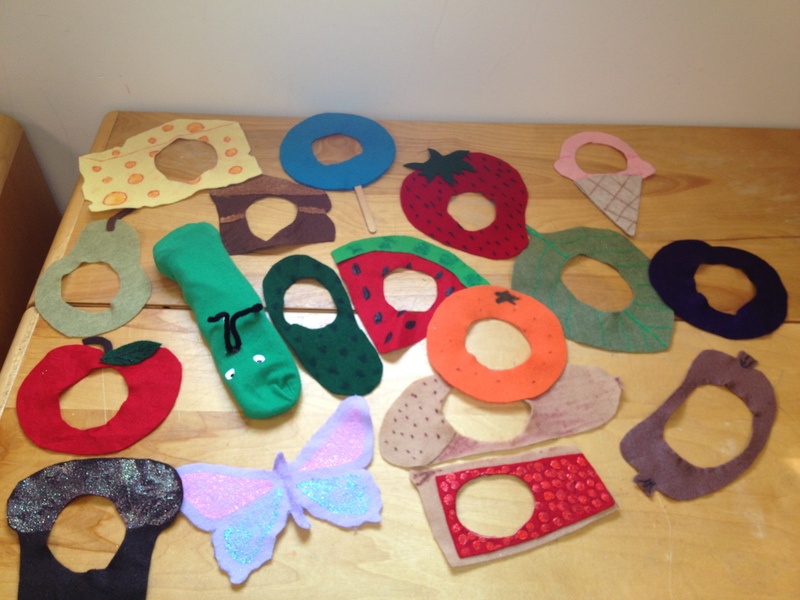 I didn’t have a felt board story for this week, instead I used a cute little caterpillar sock puppet who eats his way through pieces of felt food to go with the story The Very Hungry Caterpillar by Eric Carle. 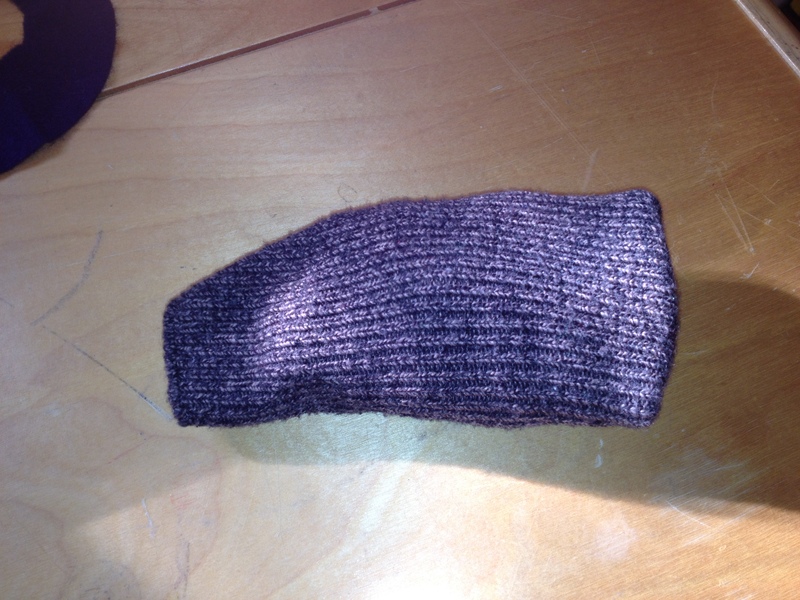 I took a plain green and plain brown sock and put them together. the brown sock goes on the inside of the green sock, so when the caterpillar goes into his chrysalis (cocoon in the book) I just turn him inside out and it’s a brown ball of sock. Also before storytime I make sure to hide the butterfly inside the set of socks, when I turn it inside out I make sure that the butterfly is still hidden somewhere in the socks. When he emerges as a butterfly at the end I pull out the felt butterfly to a lot of ooooing and aahhhing! I made the food really large so that the kids can easily slide the pieces over my arm as the caterpillar eats his way through the pieces. After the story I had the children act out turning from a caterpillar into a butterfly using cues from musical instruments. First I played each instrument, and explained the movements they would be doing. ~When I hit the rhythm sticks together the kids were supposed to crawl around pretending to be caterpillars looking for food. ~When I played the piano keys going down the scale (notes getting lower) they were supposed to curl up in their chrysalis. I used a piano keyboard app on my android for this part. A small xylophone would work as well, but unfortunately I gave away my personal kid xylophone in a frantic house cleaning incident. ~When I played the piano keys going up (notes getting higher) the kids were supposed to come out of their chrysalis and stand up, getting their wings ready to fly, just as real butterflies let their wings dry for a while before they can fly. ~When I play quick notes on the triangle they were to fly around like beautiful butterflies. After I explained what they should do with each musical cue, I had them act out the parts while I still gave verbal cues when playing the instruments. The next time I only played the instruments and they had to remember what to do. They did pretty well, I gave some hints when they got stuck at the going into the chrysalis part, but other than that they did a fantastic job! Mollie at What Happens in Storytime has the rest of the Flannel Friday roundup this week. This entry was posted in Library Feltboards and tagged caterpillar, feltboard, flannel friday, library, music cues, musical activities, storytime. Bookmark the permalink. Beautiful! I love your ideas for using musical instruments to clue the children while do creative movement. Wonderful idea! I would love to have you link to my Caterpillars and Butterflies ABC’S Blog Hop when I get it up and running this weekend. Your post would fit in so well as an Activity for exploring the transformation from caterpillar to butterfly. I really hope you will linkup! Thanks for sharing this on Flannel Friday. Always love your creativeness! Such a great idea. 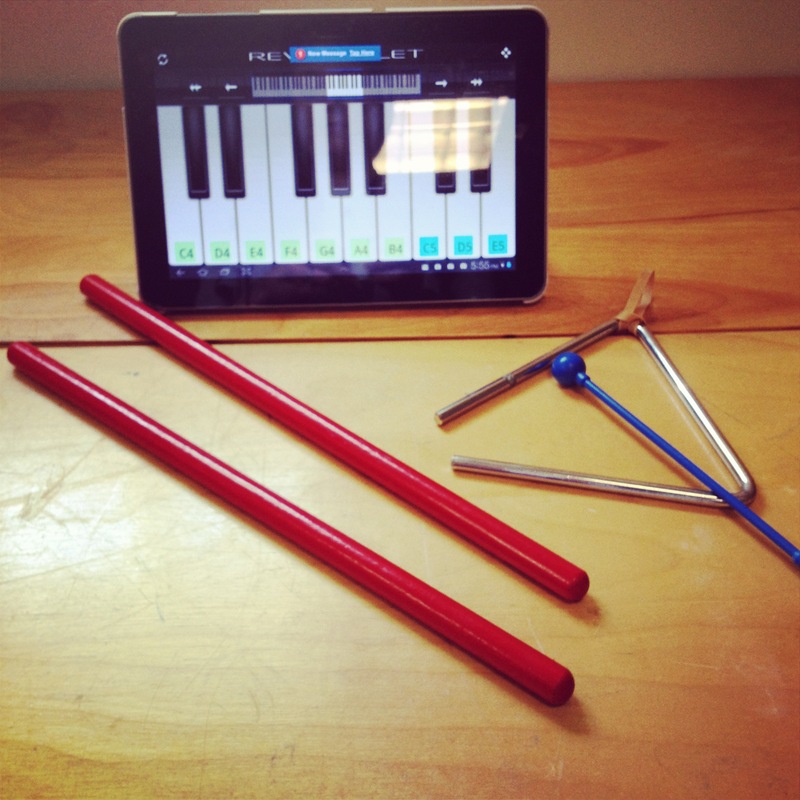 I’ve been thinking of ways to use that piano app in preschool programming– now I know what I’ll be doing! Thanks!! Great idea for creative movement with The Very Hungry Caterpillar. I think this book is one of the most versatile ones for storytime and it is always a hit!